About Florida Bats: Florida hosts eighteen different species of bats. However, you are not likely to spot many of these, as several are rare of endangered, and all of them are very fast and nocturnal. Bats often get a bad reputation due to ignorance and fear. First of all, there are no vampire bats in Florida. Second, bats are not rodents or "flying mice" as many people refer to them as. They are actually more closely related to primates. Third, bats are not blind, and they will not fly in your hair. They are not aggressive. They have good vision, and supplement it with echolocation in order to catch insects in the air. Their flight is excellent, and they have great control in the air. Their wings are made up of what are essentially arms and very long fingers with membrane stretched between. Bats use their hind feet to hang upside down. Some bats roost in trees and vegetation, but some bats like to form large groups and live inside buildings. These bat are called colonizing bats, and they can form very large groups. Is is these species of bats that usually cause problems for people and for which we need bat control. Bat Nuisance Concerns: The bats that roost inside buildings, often in large numbers, can cause a number of problems. Some are merely psychological: some people are uncomfortable living with many of these creatures of the night. Even though bats are gentle animals, they do unfortunately carry diseases, and like all animals, produce waste. Many buildings are befouled with the very strong odor of bat droppings (guano) and urine. Worse than the odor, these droppings are a biohazard to the building they are in. Fungus often grows on the droppings the spores of which can cause lung diseases in people. The name of the lung disease contracted by humans is called histoplasmosis. Bats can also carry a number of parasites, and of course are one of the animals known to carry and transmit rabies. Please do not touch any bat that you should find, and if you are bitten, please submit the bat for rabies testing. How to Know a Bat Problem: Almost all of the bat calls I get regard a colony of bats that has taken up residence inside a home or building. In almost every occasion, it is a colony of Brazilian Free-Tailed bats or Evening Bats. They like to live in large colonies, and buildings often provide the kind of shelter and high temperature that they prefer. Bats may look large when they fly, but they can squeeze into, and prefer to squeeze into, very small gaps, usually of less than an inch, and as little as 3/8 inch. Oftentimes the colony is composed of mostly females (a maternity colony), and they have their young in the attic of the building. They usually stay year round, but sometimes migrate, and then the entire colony returns every year to the same area (space provided), and grows larger and larger. These colonies can eventually reach several thousand members. Over time, they begin to leave a tremendous amount of waste behind, and once the young can begin to explore on their own, they often crawl around down the walls of the building and sometimes find their way into the living area. We provide expert bat control for the state of Florida. Call 407-729-6946 to discuss your bat problem and for a preliminary estimate. Click here for an explanation of bat job prices. Why Hire Us? Bat control work should not be attempted by amateurs. It takes an expert with a lot of experience to do the job correctly. I have performed over 100 safe bat exclusions thus far, with a 100% success rate. I always offer a 3-year guarantee on my work. I never harm or kill any of the bats. My bat elimination system (it is not bat extermination) ensures that all of the bats are safely excluded (removed) from the building, and that they will never return. To the right, you will see a photo of one of the hundreds of bat removal jobs I've done in Florida. I also offer full cleanup and decontamination after they are gone. I have worked on many extremely challenging cases in many different states. 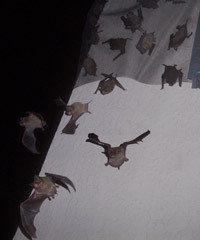 I have observed many ignorant pest control companies attempt to do bat work, and they often resort to illegal, inhumane, and ineffective methods to try to solve the problem, such as the use of "bat poison", or simply sealing them in a building to die, rot, and stink without safely getting them out first. Please do not hire an inexperienced company, for the bat's sake. They are very valuable animals. They only give birth to one young a year, they live up to 20 years, and they eat thousands of insects a night. They are not lowly creatures, and should be treated with respect. If a bat should happen to find its way into your house and is flying around or gets lost, I can come and safely find and remove it for you, at any hour. Do not try to pick up a bat yourself, particularly if it is lethargic or looks sick - this is often how rabies is transmitted. A bat in a house can bite a person, and its teeth are so small, the person might not even wake or know about it. Click here for my award-winning bat control photo galleries. Click here for an example of my bat control work. 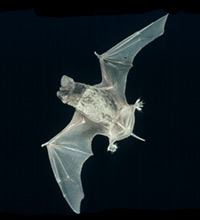 Click here to learn about Florida's bat species. The above links should help you with your bat research. It includes several how-to articles. - Bats give birth to a single baby, in late spring, and the baby is flightless until it grows large enough, usually by mid-August. This is called the maternity season, and no bat work can be done during these summer months - it won't work, plus it's illegal. - The three most common species of bats in the United States are the Little Brown Myotis and the Big Brown in the north, and the Mexican Free-Tailed Bat in the southern states. - Bats are good animals - they eat insects, they live a long time, and take care of their young very well, and they are fragile and vulnerable. - Bats in buildings most commonly reside in the attic, sometimes the walls, and sometimes a chimney. - The bats usually enter a building from a high vantage point. 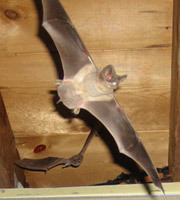 It is rare to get bats in a single-story house. - Bats live a long time, up to 15 or more years. The single baby bat is very well taken care of, and have a very high survival rate. - Bats are not rodents. Rodents, like rats and mice, can give birth to 80 babies per year, and almost all of them die within the first couple of months. - If you do not remove a colony of bats from a building, the colony roughly doubles in size every year. Small colonies start out at 30 bats, then in August when the young fly, there are suddenly 60, then next August 120, then 240, and I've seen houses with up to 5000 bats. - Some people don't like the idea of having bats living in the house, some people don't like the noise they make, some people don't like the fact that occasionally a stray bat will crawl down the wall and into the house, some don't like the health risk of bat rabies, but the main problem with a bat infestation is that they leave a huge amount of droppings (guano) in your building. It smells strongly, it corrodes building materials, and it can grow mold that can cause people lung diseases, such as histoplasmosis. - There is only one correct way to remove a colony of bats from a building: live exclusion. - Never do an exclusion during the summer months, when the attic is filled with flightless baby bats. - Bats can, and prefer to, enter buildings via very tiny gaps, usually a half-inch thick. Common entry areas include loose fascia boards, gaps in soffits and eaves, etc. Read about How to Keep Bats Away From Your House here. - STEP 1: Find out how they are getting in and out. Perform an extremely detailed inspection of the building, looking for small gaps and cracks the bats are using to gain entrance. Look for the brown staining, droppings sticking to the building, and the odor. You should also watch the building at dusk and dawn to see where they are flying in and out. - STEP 2: Install exclusion devices over the entry/exit holes. This includes one-way bat netting, valves, and funnels. These devices let the bats fly out at dusk, but then prevent them from flying back in. - STEP 3: Monitor the situation. After a few days, when you are certain that no more bats are exiting the building, remove the one-way exclusion devices, and seal the holes shut. - STEP 4: Clean the attic space - shovel out or vacuum all the guano. Spray/fog the attic and walls with a special enzyme-based microbial cleaner that destroys the organic material. - Bats cannot chew, so caulk or polyurethane sealant is a good product for sealing the entry holes shut. - Bat removal work is very detail-oriented and requires a lot of experience. I myself trained for two years before I was able to perform bat exclusions. This is not a project a homeowner should attempt to take on themselves. Call a professional. - NEVER EVER attempt to trap bats in a trap. It's more difficult than an exclusion, many will die, and it's pointless, since bats can't be relocated. Even if you try to relocate them hundreds of miles away, they will return to the same house. - NEVER EVER attempt to poison or fumigate bats. Such attempts are illegal, and usually result in the disaster of dying bats crawling down the walls and into the house. Not all bats will die, and the ones that do die will rot and stink up the building. - There are absolutely no effective bat repellents. Some people attempt to use moth balls, ammonia, high pitch noise machines, etc. These products do not work at all. The FTC has issued warnings against the use of such fraudulent products. Read more about Ultrasonic Sound Emitters for Bats here. - Bats are the animal that most commonly transmits rabies in the United States - though cases are still very rare. - If you find a bat flying around inside your house, it's most likely a member of a colony that was already living in your attic or walls. Read about How to Catch Bats here. We have articles that can help you gain a comprehensive education about bats - all of their fascinating qualities as well as their less than ideal ones. Find out whether or not bats migrate or hibernate, and if it is true that bats avoid light. Learn how bats drink water, and if they can walk on the ground. Learn some great trivia by reading about how many bugs per night bats eat and White Nose Syndrome. Perhaps the most important article is What if you are bitten by a bat.